Quickly and easily remove unwanted buffs using key bindings. Unerwünschte Stärkungszauber mit Tastenbelegungen rasch und leicht abbrechen. Rápidamente cancelar los beneficios no deseados mediante las asignaciones de teclas. Быстрое удаление ненужных баффов с помощью сочетания клавиш. 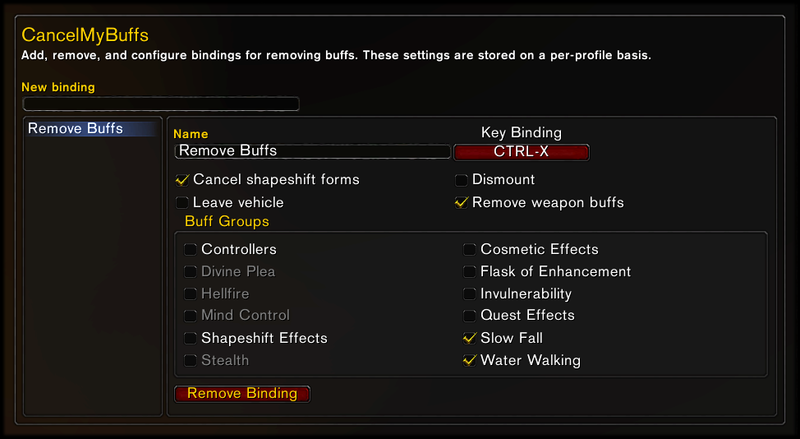 Since most buff addons can’t cancel buffs on right-click anymore due to Blizzard’s annoying restrictions, Cancel My Buffs lets you bind keys to cancel buffs without hunting or clicking. 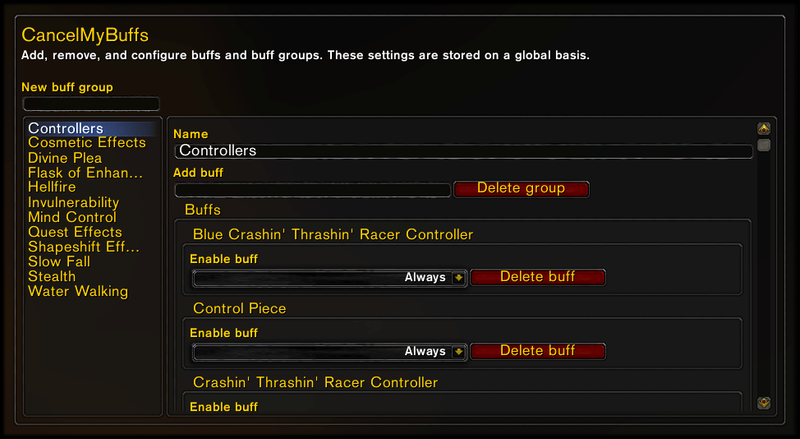 You simply choose (ahead of time) which buffs you want to cancel, add them to a group, and bind a key to the group. When you press that key, all of the buffs in the group are cancelled. Dismounting, leaving vehicles, and leaving shapeshift forms are also supported. For example, if you’re a tank, you may find it useful to bind a key to cancel Hand of Protection. I have a key just for cancelling Slow Fall effects. Type "/cmb" for options, or find them in the Interface Options window. Key bindings are saved on a per-profile basis. Buffs and buff groups are saved globally, so you don't have to set them up all over again for every different character you play. Cancel My Buffs is slightly less flexible than simply clicking off a buff, since you have to set up a fixed list ahead of time of the buffs you want to cancel, but once you've done that, it is faster than hunting through buff icons to click off Hand of Protection. Plus, it works no matter which buff addon you use! Due to Blizzard restrictions, it is not possible to remove a buff only if certain conditions are met. For example, you cannot remove Aspect of the Cheetah only if you’re Dazed. When you press your chosen key, all of the buffs on your list will be removeed if you have them, and the list cannot be edited while in combat. If there’s a buff you think should be included in the preset buff groups, post a comment with the exact buff name and spell ID. Hint: it’s the number in the URL if you look the buff up on Wowhead. For other ideas and suggestions, submit a ticket. If you encounter a problem with Cancel My Buffs, please try some quick troubleshooting steps, and then submit a bug report to let me know about the problem. Please copy this list into your ticket and fill in as much of the requested information as you can. Please do not include any lists of local variables or installed addons that your error display may add! Remember to check on your ticket after a few days, as I may need more information from you in order to find and fix the problem! Compatible with all locales. Translated into English, Deutsch, Español, 简体中文, and 繁體中文. To add or update translations for any locale, enter them on the Cancel My Buffs localization page on CurseForge, and then leave a comment or send me a PM to let me know that you’ve made changes. If you don’t tell me, I may not notice your translations for weeks or months or even longer, since CurseForge doesn’t give me any kind of notification! If you don’t have a Curse account and don’t want to create one, you can PM me your translations instead. Thanks! This is the comments section for discussion and support directly related to Cancel My Buffs, not a general macro help board. There is a whole Macro Help forum for that kind of thing; please use it. Last edited by Phanx : 11-18-12 at 01:55 PM. not specifically related to cancel my buffs, but is it possible to create a macro that could be dragged to an action button that would activate a keybind? in the case of cancel my buffs, i would like to be able to still "click off" the buffs by clicking an action button. Compatible with both 4.3 live realms and Mists of Pandaria beta realms. Use the “Load out of date addons” checkbox on beta realms — the TOC won’t be updated until Patch 5.0 goes live. This version has been completely rewritten from the ground up, with a focus on configurability. You can now create as many bindings as you want, add your own buffs and buff groups in-game, and remove any bindings, buffs, or buff groups you don't want. You can configure whether a buff should always be included in a group, only included when you know the spell, or only included on some classes. Bindings are saved on a per-profile basis. Buffs and buff groups are saved on a global basis, so they are available to all profiles. Last edited by Phanx : 07-20-12 at 03:10 AM. A beta version of the next release is now available, including multiple keybindings, custom buffs, and more. Ice Block is part of the default “Invulnerability” group, so if you have that group enabled, it should get cancelled. Let me know if it’s not working! Oh, I didn't know that. Tried the Invulnerability group now and it works great. Thanks! Would it be possible to add Ice Block to the list of cancellable buffs? Getting closer to multiple buff canceling groups!